As a fully seaworthy yacht, the First 211 has many features to offer. The large cockpit, provided with comfortable teak benches can comfortably accommodate 4 people. Two lockers provide plenty of storage space on deck. The deck layout is clear, concise, functional and equipped with high-quality fittings. Its elegant silhouette with the gently sloping forward cabin roof and wellspaced outer chain plates provide ample passage onto the foredeck. The solid teak footrailing circumfrancing the yacht provides extra security. Below decks For a small seafaring yacht the amazing spaciousness is achieved by a roof frame built-into the cabin. This makes the usual transverse bulkhead superfluous and through the hinged hatch ensuring full standing height in the lower area. The solid teak footrailing circumfrancing the yacht provides extra security. Below decks For a small seafaring yacht the amazing spaciousness is achieved by a roof frame built-into the cabin. This makes the usual transverse bulkhead superfluous and through the hinged hatch ensuring full standing height in the lower area. 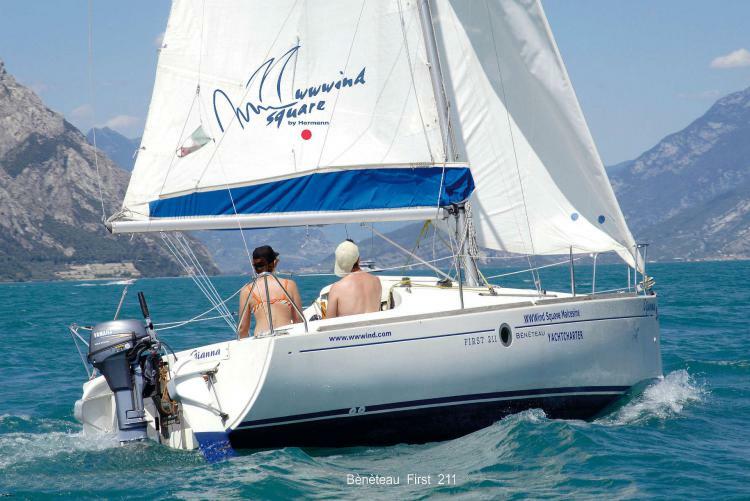 The First 211 Beneteau: seaworthy, fast and comfortable - guarantees ongoing sailing pleasure.